At Binick Imaging in Miami, we’re proud to be a premier provider of window graphics, wall wraps, and everything else your business needs for advertising or promotion. From small banner printing to large-format window signs, we can create it all! 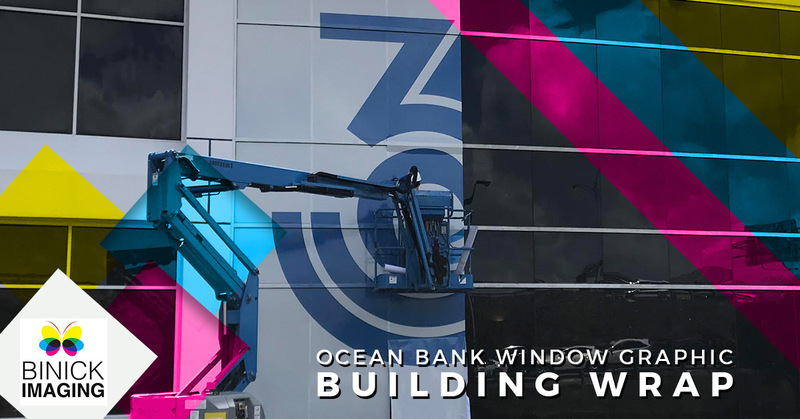 One of our recent projects was the installation of a large-scale window graphic on the Ocean Bank building. As you can see, there were many windows to cover, and using a micro-perforated vinyl with optical clear gloss lamination, we were able to create the perfect graphic for the front of the building. The installation took some time, but since we had the right materials and the proper measurements, we were able to integrate the graphic seamlessly into the design and architecture of the building. Your logo or brand name is likely displayed on the front of your building, but window graphics give you the opportunity to incorporate an eye-catching design that can attract potential customers. Whether it involves lettering or a certain pattern, the right window wrap can provide the perfect appeal for those driving or walking by your building. 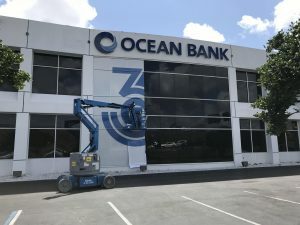 With the Ocean Bank window wrap, they were promoting their 35th anniversary of being in business. With your graphics, you could promote a new product that you want to showcase. You could also advertise an event that’s coming up, such as a big sale day or the grand opening of a new location. Instead of blank windows staring back at people walking by your building, you can improve the view by adding the perfect graphics. If you’re renovating the inside of your office, or rearranging your store, a window wrap can block passers-by from seeing the mess of construction and renovation. These graphics can also improve the view inside the store by blocking your customers’ view of a busy street or a cramped alley while they’re browsing your products. People may be familiar with your brand, but a window graphic can reinforce that brand every time someone walks by your building. They may not come inside every time, but they’re always being visually reminded of your presence and what you have to offer. For Ocean Bank, they wanted to show that they’ve been in business for 35 years, providing the people of Florida with exceptional banking and financial services. Not everyone who sees their window graphic may be an Ocean Bank customer, but they may become one in the future! There are many other benefits to adding window signs and graphics to your storefront or commercial building. No matter what you sell or what service you provide, you’re always looking for ways to attract new customers. If your old signs or banners aren’t getting the job done, then contact Binick today to learn more about our window graphics services. Take a look at our Portfolio to view some other window projects we have worked on in the past. If you have questions about our process or our pricing, then please contact us right away to learn more about our services.